Seagrass secures the lagoon bottom, reduces erosion, and is an important primary producer for the ecosystem, providing habitat and food for many types of lagoon life. The seagrass scores below clearly show the recent seagrass losses throughout the lagoon, even in the Mosquito Lagoon South, where historically seagrass has thrived. There are several reasons for these losses. Seagrass needs saltwater and high levels of light to survive. Heavy freshwater drainage into the lagoon negatively impacts sea grass, especially if salinity drops below 10 ppt for long periods of time. Drainage canals and stormwater also bring sediment into the lagoon, which can smother seagrass and prevent light from reaching the bottom. Too much nitrogen and phosphorus feed excessive algae and phytoplankton which reduce the amount of light reaching seagrass on the bottom. Herbicides and poor boating practices can also destroy sea grass beds. 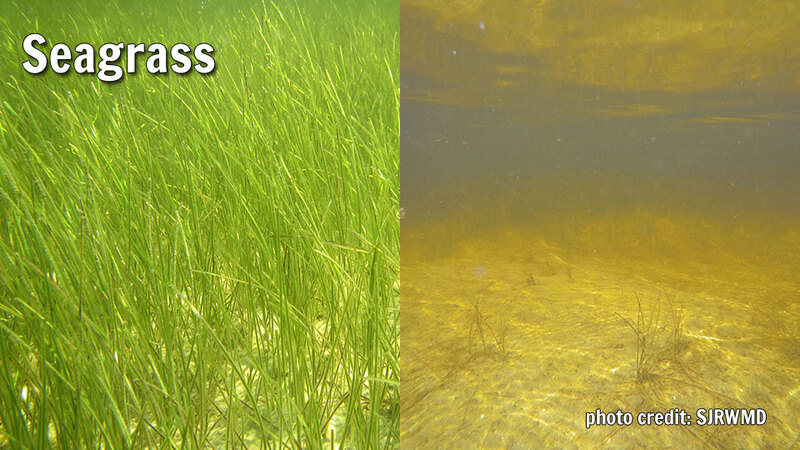 Seagrass does not grow in the North Mosquito Lagoon due to natural conditions (NA). The regulatory targets for seagrass are linked here. How seagrass scores were calculated are linked here.